I feel privileged today. Al Gore has sent me an e-mail asking me to help him track down and kill manbearpig. Folks like you know what I believe: We have no more important priority than confronting and solving the climate crisis. Luckily, we have a President who has taken up that task with both determination and seriousness of purpose, and it’s amazing what a difference that can make. In June, President Obama empowered the Environmental Protection Agency to cut carbon pollution, a move which will help reduce dangerous CO2 from power plants by 30 percent in 2030. On top of that, he has established new fuel economy standards that reduce CO2 levels and will save us all money at the pump. With the Recovery Act, he made the single biggest investment in clean energy in the United States, ever. All these steps will have a lasting impact on the planet our children and grandchildren inherit — and they wouldn’t have happened without your support. If you stand with President Obama, add your name to support Democrats working with him to address climate change. As Bob Dylan sang, “You don’t need a weatherman to know which way the wind blows.” We’re seeing real, important progress in the fight against the climate crisis — and it’s coming not a moment too soon. But you and I both know there are still a lot of deniers out there. The time for leadership in the face of this threat has not passed. If ever there were a moment to send leaders to Washington who make climate legislation their top priority, this is it. It is really too bad that there are so many deniers out there so refuse to take the former vice-president serial. What does he have to do to convince the deniers? Present actual empirical evidence for what he claims? If you want to know why I am one of those deniers who cannot take Mr. Gore or the other climate alarmists very serial, it is because they do not act in a particularly honest manner. They do not simply state facts. The try to generate panic by exaggeration and misdirection. They try to bully people who disagree with them and fantasize about blowing such people up. Carbon dioxide is not, in any way dangerous nor is it pollution. Carbon dioxide is a naturally occurring substance in the Earth’s atmosphere that is absolutely necessary for life on this planet. The Earth’s climate is not at a delicate equilibrium that can easily be disturbed by human activity. The Earth’s climate has changed drastically over the eons and will continue to change long after we are gone. Another reason I cannot take people like Al Gore very serial is the hypocrisy of their position. Despite what Gore says, cutting “carbon pollution” from power plants and imposing stricter fuel standards will increase the cost of energy in this country. This won’t affect Al Gore. He has no intention of giving up his mansion or jetting around the world to spread the message about manbearpig . It will hurt the rest of us. 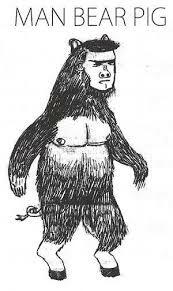 Well, since manbearpig has been spotted in southern Indiana, I guess I should get with Mr. Gore and help track it down. Maybe I can get a nobel prize too.